Engineers in the pharmaceutical industry are creating modular, continuous, and scalable processes and manufacturing environments to meet cost and quality challenges head on. Pharmaceutical manufacturers are under constant pressure to fast-track innovation and increase the speed at which they introduce successful drugs to market. Various scientific advances are fueling a fresh wave of pharmaceutical manufacturing innovation. These advances are supported by the U.S. Food and Drug Administration (FDA), which is helping accelerate the industry’s throughput of lifesaving medicines and therapeutics by taking a more pragmatic approach to regulation (1). Many institutions estimate the cost of developing a successful first-in-class therapy at more than $2 billion (2). To lower that cost, companies must optimize every aspect of development and manufacturing. This article reviews current drug development trends and their impact on pharmaceutical manufacturing. It examines how the industry’s manufacturing leaders are creating modular processing environments and applying continuous-flow technologies and single-use systems to meet quality, efficiency, and flexibility objectives. The article concludes with a look at the future of pharma, where personalized therapeutics will be critical in fighting cancer and genetic disease. The FDA’s Center for Drug Evaluation and Research (CDER) approved 46 new molecular entities (NMEs) in 2017, double the number approved in 2016. The therapeutics approved in 2017 include 34 small-molecule drugs and 12 biologics. This represents a 21-year high in total approvals, besting the 2015 record of 45 (3). Data from pharmaceutical market research firm ISR Reports (Figure 1) reveal that research and development (R&D) spending by 41 global pharmaceutical companies (i.e., drug owners and primary drug developers) was more than $32 billion in the first quarter of 2018, roughly a sixth of the overall ~$190 billion in revenues generated by those companies during the same period (4). ▲Figure 1. Research and development spending by 41 pharmaceutical companies totaled more than $32 billion in the first quarter of 2018. This is nearly a sixth of the overall revenue generated by those companies during the same period. Source: (4). The time, resources, and finances necessary to move a molecule from conception to commercialization is a staggering barrier, but many organizations are up for the challenge. According to Pharma Intelligence’s “Pharma R&D Annual Review 2018,” the total pipeline — characterized as all drugs in development by all pharmaceutical companies — has increased for the seventh consecutive year, an all-time high (5). Pharma Intelligence notes there were well over 4,000 companies with active R&D pipelines in 2018, the total number approximately doubling since 2008. Growth in pharmaceutical R&D reflects several trends, including the impact of advancing biologic science and the mainstreaming of biopharmaceuticals to treat an expanding list of diseases and conditions. For example, Labiotech.eu calculated that the sales of the top-selling large-molecule biologic drugs (e.g., Avastin, Enbrel, Herceptin, Humira, Remicade, and Rituxan) topped $53 billion in 2015. Research firm MarketsandMarkets predicts that the global active pharmaceutical ingredient (API) market — including chemical and biologic drug substances, both branded and generic — will expand at a compound annual growth rate (CAGR) of 6.3%, and will climb from $157.95 billion in 2016 to $213.97 billion in 2021 (6). Grand View Research expects small-molecule APIs to account for the largest share of the market, jumping to $239.8 billion by 2025. That figure reflects the rate of approvals for drugs based on chemical and biologic APIs (7). 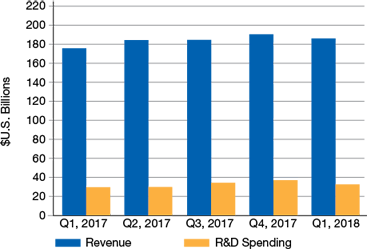 Nearly 75% of the drugs approved in 2017 were small-molecule API formulations (8). In recent years, ownership and management of the means of production are shifting from larger pharmaceutical companies to contract manufacturing and contract development organizations (CMOs and CDMOs). Drug companies like GSK, AstraZeneca, and Pfizer are increasingly using contract partners strategically to fill capacity and expertise gaps to produce their branded drugs. Other drug owners are seeking longer-term contract and development partners because such organizations have the development and manufacturing expertise and operational know-how to accelerate the drug’s speed to market. Having a strong manufacturing partner, it is hoped, will help them better manage the costs and risks of development, quality control, and regulatory compliance more effectively. Results Healthcare, a consulting firm that takes a close look at the pharma industry each year, expects outsourced pharmaceutical manufacturing to increase in the coming years, especially for small-molecule formulations. According to its “Pharma & Biotech 2017 — Review of Outsourced Manufacturing” (9), in light of burgeoning demand for APIs, CDMOs face the real challenge of capturing more value from drug product supply chains. “Overall, the level of outsourcing is 24.6% at present and this is expected to grow,” the report states (9). They predict outsourcing will rise to just over 26% by 2021. Many of the industry’s manufacturing leaders are exploring technical solutions that can increase quality, process throughput, and yields. One of the most promising solutions being studied and implemented is continuous manufacturing (CM). CM is proven across the fine chemical industry (among other industries) and it is slowly gaining traction as an effective way to produce chemically synthesized APIs. Drugs produced by CM can have a lower cost of goods sold (COGS) and higher quality than drugs made by batch processing. 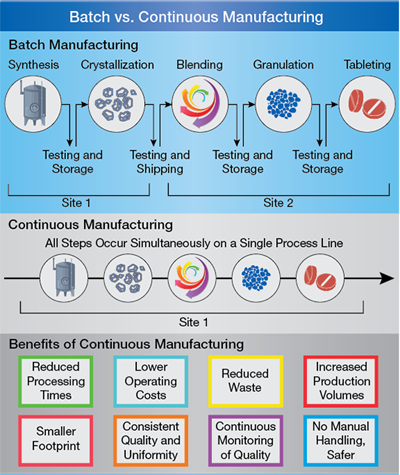 In a 2018 report, Sau Lee, Director of the Office of Testing and Research within the FDA, presented the case for CM, noting that recent advances in manufacturing technology have prompted the pharmaceutical industry to consider moving away from batch manufacturing to faster, more-efficient CM (10). Batch manufacturing involves discrete steps (Figure 2). Typically, production comes to a halt while samples are tested for quality offline. During these hold times, the material may be stored or shipped to other facilities globally to complete the manufacturing process. This can greatly increase the time it takes to make drugs, adding weeks or months to the process. All of this introduces risk to quality and the continuity of the supply chain. ▲Figure 2. Batch manufacturing involves discrete steps in which production stops between steps so samples can be tested for quality offline. Pharmaceuticals made using continuous manufacturing are moved nonstop within a single facility, eliminating hold times between steps. Material is fed through an assembly line of fully integrated technologies, which saves time and reduces the likelihood of human error. Both batch manufacturing and CM are subject to the same quality control standards, but monitoring is automated in CM facilities and tends to be more frequent than in batch manufacturing. Like all technology, CM equipment is subject to wear and tear, but automated monitoring can detect issues long before a failure occurs. Monitoring also can help predict the life expectancy of a piece of equipment, enabling better proactive maintenance. More in "On The Horizon"
The Hydrogen Economy Is Coming - The Question is Where? Process Intensification: Has Its Time Finally Come?